If you have been following the MWC 2011 coverage with us this time, you would know by now that new Android phones are raining this time. This is undoubtedly the most exciting MWC ever, especially for all the Android fans. 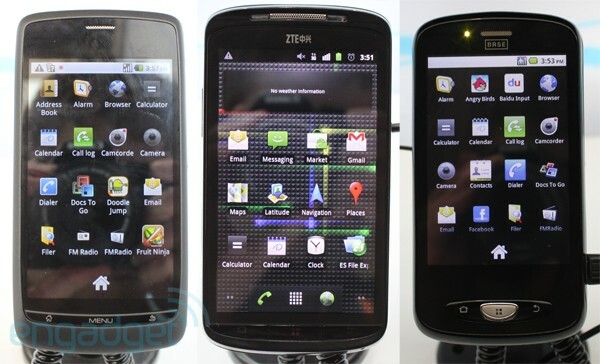 The Chinese manufacturer ZTE corporation has also come out with a range of 3 new Android phones. We had already reported about the ZTE Skate. Joining the club with ZTE Skate, are Amigo and Blade. We will walk you through the features of all the 3 new Android phones announced by ZTE. ZTE Amigo falls lower on the specs and features and should be the cheapest of the 3 new offerings from ZTE. Triple band GSM 1900/2100 HSPA network specifications. ZTE Amigo also sports a side-slide physical QWERTY keyboard. ZTE Blade is on the middle position (specs and price wise) out of the three Android phones. Pre loaded with Android 2.2 (Froyo). We had already reported the announcement of ZTE Skate, the Android phone with Android 2.3 (Gingerbread). ZTE Blade sports a large 4.3 inches WVGA screen. It is powered by 800 Mhz processor. It sports a 5 megapixels camera.